In December, I had the delightful privilege of seeing Perfect Nonsense on tour at the Theatre Royal in Bath. 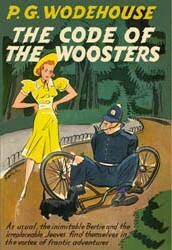 For anyone not already aware, Perfect Nonsense is a stage adaptation (by David and Robert Goodale) of The Code of the Woosters. It’s been well received by West End audiences since opening in 2013, and is now touring the UK until mid-2015 (see the official site for details). If you’re planning to see the show and don’t want to read my review, look away now. The Goodale brothers’ clever adaptation sticks closely to Wodehouse’s original story and delicious dialogue, ensuring a production that is pure Wodehouse. But Perfect Nonsense is not a mere staging of the book. The Goodales have added their own comic twist by having all the characters played by just three actors. The play opens with Bertie Wooster reclining in a favourite armchair. He begins to tell us the sorry tale of his recent entanglement with Madeline Bassett, Gussie Fink-Nottle, old pop Bassett, Sir Roderick Spode and an eighteenth-century cow-creamer. Wodehouse fans in the audience will know where this is going. To assist in the retelling, Bertie enlists the help of Jeeves, and Seppings (Aunt Dahlia’s butler) to ‘play’ the other characters in his narrative. This ingenious strategy adds something new for Wodehouse fans, without detracting from Wodehouse’s original work — it is also great fun. Jeeves and Seppings undergo an exhausting repertoire of inventive costume changes, in which lampshades become hats and curtains become dresses. The hard-working Seppings is, at one point, dressed as Aunt Dahlia inside a giant Spode suit. John Gordon Sinclair and Robert Goodale were utterly entertaining and memorable as Jeeves and Seppings (played by Matthew Macfadyen and Mark Hadfield in the original cast). Bertie’s role is physically less demanding, with no elaborate costume or character changes to contend with, but requires a delicate balance of jovial stupidity. 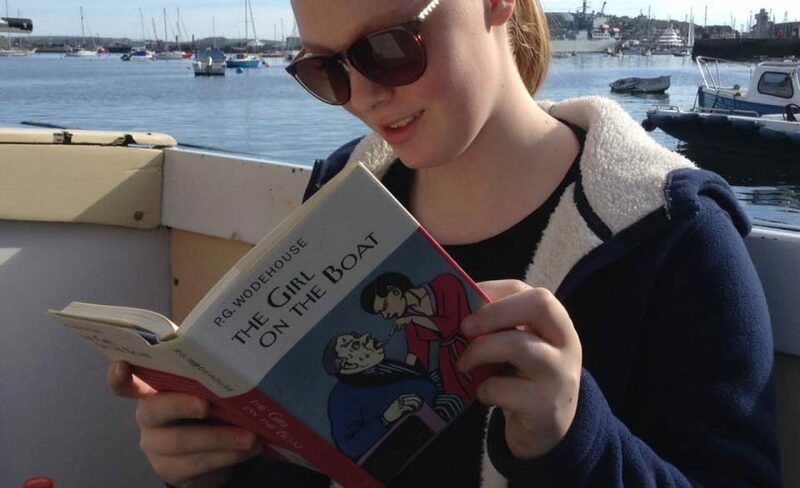 It’s not an exact science, but Wodehouse fans can be unforgiving when actors get it wrong. Stephen Mangan was well received in the original cast, and I thought Joel Sams did a sound job (as cover for James Lance) in Bath. Inventive sets were a highlight of this production, with two revolving interiors that cunningly transformed from Bertie’s London flat into an antique shop in the Brompton Road, various locations around Totleigh Towers, and even accommodated a thrilling drive in Bertie’s two-seater. Set changes were comically incorporated into the theatrics: Jeeves twiddles a handle on the wall to change the painting over the fireplace, while Bertie jiggles paper flames at the end of two sticks. The dog Bartholomew also makes notable appearances. These small details added to the joy of the performance, without detracting from the complicated storyline or Wodehouse’s original dialogue. No doubt a Wodehouse purist, for such creatures I regret to say exist, would find something in this adaptation to pick on. It is often argued that Wodehouse ought not be adapted at all – that it somehow sullies the perfection of his art. But while comic prose was certainly his forte, Wodehouse’s versatility as a writer included a long association with the theatre, predominantly as a lyricist, but also as a writer and critic. As an added bonus, a reminder of Wodehouse’s theatrical career is provided by Tony Ring in the Perfect Nonsense programme. During his lifetime, P.G. Wodehouse demonstrated a willingness to experiment with different forms and genres, and to collaborate with others. Intelligent adaptations like Perfect Nonsense remind us of this wider legacy, and remain welcome by fans who simply cannot get enough of his stuff. Thanks to regular readers who contacted me during my recent absence from Plumtopia. Awfully decent of you! Results of the Wodehouse Survey are currently being collated into a paper for the 2015 convention and will be shared here in due course. Welcome back, Honoria! A juicy post, as always!! Thanks Ashok. I hope you have the opportunity to see the play. Unless it travels to my part of the world! I hope it does. You never know your luck. Perfect Nonsense just finished a run in SA as well, but sadly I was unable to go see it. Hopefully it will return soon, as I hear it was sold out every performance. You make it sound very memorable. I have a feeling this one will return so hopefully you get to see it next time around.